Nehru Science Centre is under the aegis of National Council of Science Museums, an autonomous society under the Ministry of Culture, Government of India. We the peoples of the United Nations: UNITES is a catalyst to inspire people to effectuate change to create the future we want on Earth and that of our Species. Climate Action reimagined: We’re seeing a rapid increase in climate change challenges. The new normal requires individuals and organizations to keep pace with the complexity of the challenges and the economics of the future. Case studies shared: UNITES is built to create an ecosystem for practitioners of action which create a better world. We’ll share real-life experiences, big and small, successful and not so successful – that we all can learn from. UNITES includes a COP+22 Session which has the prestigious labelled event status of the steering committee of United Nations Framework Convention on Climate Change COP+22, Marrakech. 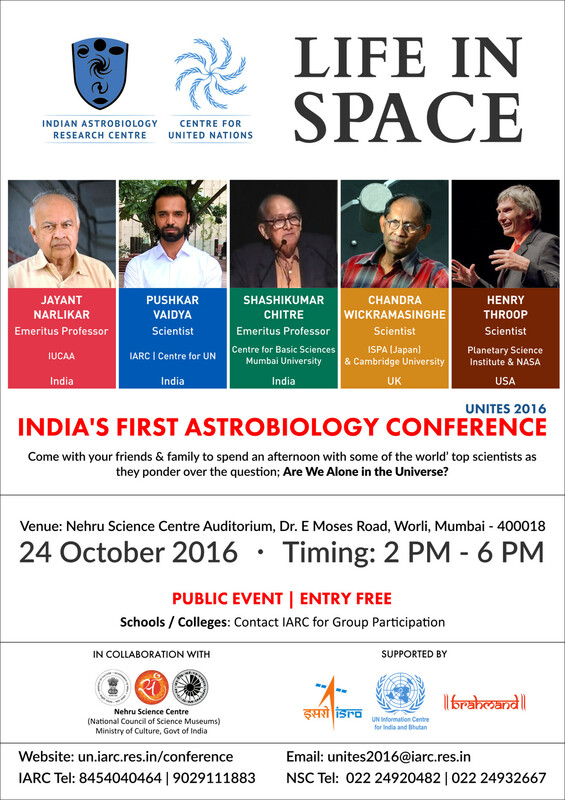 UNITES includes a WSW+16 Session which is an official listed event and includes India’ first Astrobiology Conference.